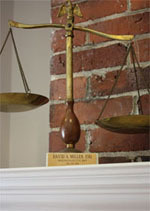 The Law Office of David A. Miller, PC, is a general practice law firm specializing in fair and diligent representation of individuals and small businesses. We are capable of meeting a wide array of legal needs and are committed to providing high-quality, cost-effective solutions for all of our clients and their legal problems. At the Law Office of David A. Miller, PC, we have been serving individuals and businesses throughout the Commonwealth of Massachusetts since 1992. Attorney David A. Miller founded the Law Office of David A. Miller, PC in Boston and he has a wide ranging background and in depth and comprehensive understanding of many of the most important and salient legal practice areas that effect individuals and small businesses regularly. Whether you are looking for representation experienced in the areas of business law, real estate law, civil litigation, estate planning, family law, bankruptcy or other areas, the Law Office of David A. Miller, PC can handle your case effectively and efficiently. Legal problems can pose a significant threat to your financial security and your personal rights. It is important to protect your financial assets and your personal rights by utilizing an experienced attorney whom you can count on. At the Law Office of David A. Miller, PC, we offer experienced advocacy, attentive service and proven strategies to achieve positive results for our clients.